Merry Christmas Ladies! I hope and pray your Christmas is a great one. Feel free to share your stories below! What did your hubby get you? What did you get him? The kids? How did it go with family? What happened? I am currently the only one up! My husband and children are still SLEEP! Its 8:11am and you know that's late for kids on Christmas, but they stayed up late too! Last night we put reindeer food (oatmeal and glitter) out in the backyard. My son brought it home from school. My son is really into Christmas this year and all he wanted was a Wii! He wrote a letter to Santa and we put in the mailbox too! He prayed for it too! And up until last night he still hasn't saw us go get a Wii so he said, "Santa didn't get my letter Mommy." I asked, "How do you know?" He responded, "Because I still don't have a Wii!" I said,"Christmas is tomorrow, so wait and see what happens!" I can't wait until he opens the last box under the tree. We got him the Red Wii and it came with the new Super Mario game. Well enjoy your weekend! How important are you girlfriends to you? When you get married your husband is supposed to be your best friend. He is suppose to be the one you share all your secrets too. He is supposed to know you inside and out. BUT does he? Is your husband your best friend or do you have a Gayle (King) in your life? How important are your girlfriends in your life? Being married, do you still need a host of girlfriends? Or at least one? The next set of paragraphs were taking from Heather Long (families.com). She had good insight into why we need or rely on each other and wanted to share. Enjoy! Married women need female friends for their coffee breaks, their girl's night out or just their morning walks. They need them when they take their children to the park. They need them when they are sharing errands and chores like getting the kids to school, planning the big recital or wanting to throw a birthday party. Female friends let married women take a break from being Super Mom and Super Wife. They can be women. They can relate. They can talk about issues with each other that they can rarely talk with others about. We are so used to multi-tasking in our lives and we are so used to running all the time that we sometimes forget how important our social connections are. 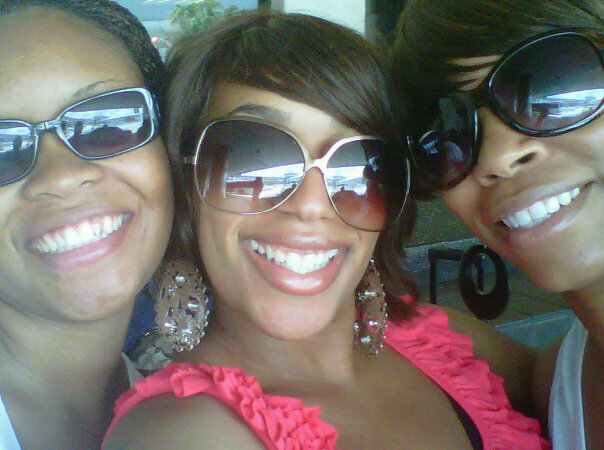 As mothers, we benefit from talking to other moms who have been through the same things we have. As wives, we relate better to women who have shared our experiences. As women, we experience a unique emotional connection with our female companions that is very different from the intimacy and emotional connection we feel with our spouses. Our friendships, our social connections are vital to our emotional health. Our friends provide a unique support that we cannot receive from our families or children. They care about us as individuals and they care about our opinions and our feelings. They also enhance how we feel about ourselves. Sometimes, we get so caught up in caring for our families, our spouses, our children, our jobs and our responsibilities that our girlfriends may be the only people who can reach out to us and let us slow down. They can share our experiences. They can tell us jokes. They can listen to our stories. We need our girlfriends. The need for these social connections does not minimize our other relationships by any measure - but we need all of these relationships for different reasons. Hello ALL! 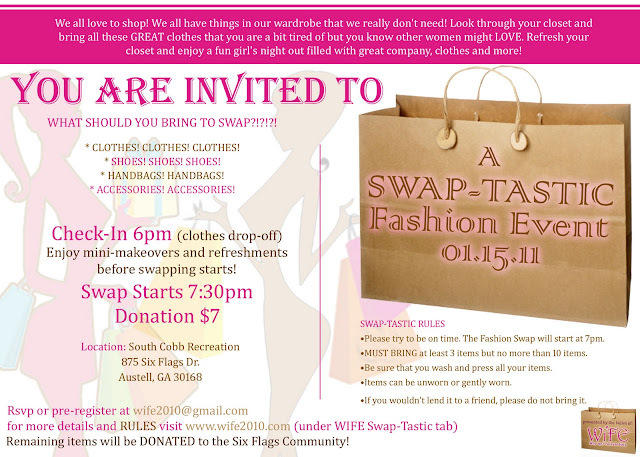 The Ladies of WIFE are having our FIRST SWAP-TASTIC FASHION SWAP EVENT! We are so excited about and hope you come out are ready to swap and have a great time! Read flyer for details. Also there will be a special tab above for more detailed information! Thanks for all your support! Hello everyone! How is your day going. Well we are one Holiday down and 2 to go! It's amazing that when you are married you always have 3 options; your home, your husbands parents' home or your parents home. Which one do you choose. For us it's always a hard decision because of course we want to see everyone but we also want to have our own tradition for our children at home. My husbands family lives in Florida so of course we don't get to see them as often as we would like to. This Thanksgiving, we went to Tennessee and spent it with my grandmother. And I know she might expect the same thing for Christmas but it's not going to happen. We now have to decide to go to Florida and spend it with my in-laws or stay home and (hope the in-laws want to make the trip to see us!) 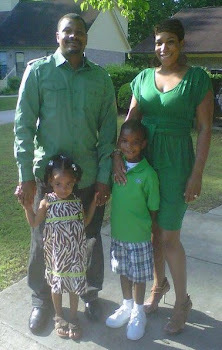 My attitude is let's stay here this year, spend the gas money (driving back and forth to Florida) on the children! Last year for Christmas, we went to Tennessee! LET'S STAY HOME! Now that we talked about the travel dilemma, what about the atmosphere? Do you get along with his family and vice versa? My husband gets along good with my side so that's always a good thing. And I actually really adore my in laws. He has a great set of parents and they have been married over 35 years. His grandparents were married over 50 years! He has a big family so every time they come together for just a meal, it's a reunion atmosphere and I like my children around that because my immediate family is rather small. I really don't have any crazy stories about family members acting up or major arguments around the holidays. For my husband's family, the holiday revolves around food! Good food! 1) Be loyal to your mate. Your first allegiance is to your spouse. No matter how heavy a guilt trip your relatives lay on your shoulders at holiday time, recognize that you and your spouse are a couple. By promising to love, honor, and work through the toilet seat issue, you have created your own family. Now that you're a team, work as one. This doesn't mean that you should throw out your family and in-laws as you would your old Partridge Family albums. Instead, make your in-laws a part of your new family, the one you have formed with your beloved. There are times when you can sit on the fence -- but making a decision about which in-laws to spend the holidays with isn't one of them. With your spouse, discuss all areas of potential conflict and then create a game plan. Figure out where you're going for the holiday, when, and why. Plan what you're going to say when the other side pitches a fit. Use the worksheet you filled out earlier to crystallize your thinking. 3) Recognize that you can't be all things to all in-laws. As you've probably learned, whatever decision you make is going to upset someone. That's life. There are so many valid issues that you can chew yourself up over, so why make this one of them? Save the angst for other issues. Make your holiday decision, announce it to the relatives, and move on. I know this is a lot easier said than done (especially for someone like me who can hold a grudge until it reaches legal age), so work with me here. 4) Tell people immediately of your plans. Remember how angry you were when some of your wedding guests canceled at the last minute? "I'll never be such a stinker," you said. So don't be. No Scarlett O'Hara "tomorrow is another day" pronouncements on this issue.If you can't or don't want to accept an in-law's holiday invitation, don't dodge the issue. Instead, bite the bullet and tell them as soon as possible. In addition to getting rid of an onerous duty, early notice also allows your in-laws to make alternate plans, if they so desire. Always check out all invitations with your spouse before you say yes or no. Try, "Thanks for the invitation. I'll talk it over with my beloved and get back to you." Never take it on yourself to make a decision about your whereabouts on a holiday -- even if your spouse doesn't celebrate it. If you want to surprise your spouse, men, unload the dishwasher or drop a few diamonds in her Diet Coke. Ladies, ditto on the dishwasher, but a Porsche usually goes over better than a diamond. You can decrease holiday stress by concentrating more of your time on celebrating the way you like and involving more in-laws in the preparations. But don't forget to set aside some time to rest and relax! 7) Respect your in-law's decisions. If one or more of your in-laws doesn't want to come to your holiday celebration, don't be a sore loser. Don't whine, nag, or moan. And don't pressure your in-laws to change their plans. Respect their decisions and you have a better chance of having them respect yours. There's no denying that the holidays can be very tense under normal circumstances, but they can be especially trying if the year has been difficult. If someone has become ill or, God forbid, passed on, you may want to vary the celebration to overcome the trauma. This might be a good year to set the party in a different place or even take a family vacation instead. 9) Look for workable solutions. Life isn't always black-and-white; there's a lot of room for gray between the lines. For example, say you want to spend New Year's Eve home but your in-laws want to have a party instead. Instead of giving a flat refusal, see what compromise you can work out. Maybe your in-laws could come to your home for dinner and then you could ring in the New Year at their party. This won't always work, but it's worth a shot. 10)Involve your in-laws in your traditions. I'd be messing with your head if I said that it's easy to get everyone to play together nicely. Most people never learn to share their toys. For instance, some in-laws want to be included in every party and get angry if they're excluded; others just have very different styles of entertaining. Nonetheless, set aside some time for a ritual or two. It doesn't have to be something major like chopping and trimming a 200' blue spruce Christmas tree. Your rituals may be small and charming, like an hour of caroling or a evening of hot chocolate and cookies.